I had a really interesting job this last week. A homeowner in a house from 1860 is having some wiring problems, including a small electrical fire. The house is full of old 2-wire cloth cabling, which was never grounded, and is past its useful life, in some cases. The concern there was two-fold, first of course is safety, and secondly, the house is beautiful, and fully remodeled. 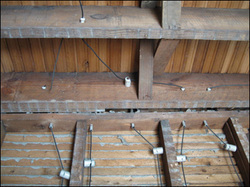 Now, how can I ensure the safety of the electrical system, without tearing apart the whole house? The answer turned out to be simple. Replace the branch circuit breakers with arc-fault breakers. These new high-tech breakers read the electrical signal of the circuit, and will trip at the slightest arcing in the wiring. So if a mouse, or a nail, or simply old wiring should cause a problem, the breaker will open, and de-energize the circuit, before a fire would ensue. I expect that I will find a few of the circuits are are damaged, but at least I can focus on the ones that really need attention, minimizing repairs. LaMorte Electric was founded by Brian LaMorte to provide quality electrical contracting services to Ithaca (14850), Tompkins County and the surrounding areas. All of our Electricians are highly trained, clean, polite, and prompt. It is not uncommon for electricians to be rude, late, or turn down work that they think is beneath them, we promise to treat you the way you want to be treated. If you would like to see our reviews of LaMorte Electric, click here.